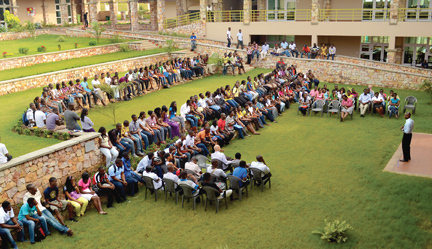 Patrick Awuah ’89, president of Ashesi University College, addresses first-year students in the David Cornfield & Linda Archer Cornfield Courtyard at the college in Ghana. Some members of the 650-member first-year class are enrolled in Re-Envisioning Diasporas, a new cross-continental course offered by Swarthmore and Ashesi. This video is not a typical educational documentary. It is footage shot by the students’ fellow classmates, more than 5,000 miles away at Ashesi University College in the West African nation of Ghana. This classroom connection—the most recent and most innovative of many exchanges between Ashesi and Swarthmore—is the product of a deep bond between the two colleges, forged when Ashesi President Patrick Awuah ’89 founded the Ghanaian institution in 2002, modeling it on his alma mater. 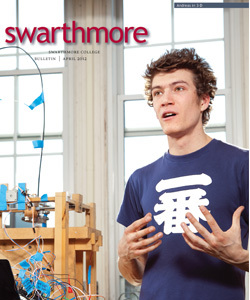 Re-Envisioning Diasporas, offered for the first time this spring, is adding an important new dimension to the way some Swarthmore students are learning. Cross-listed in film and media studies and literatures in translation, the class is structured so that students interact, via Skype, for 30 minutes per class meeting, with their 35 Ghanaian counterparts in an exchange of ideas about the meaning of diaspora. The course is co-taught by professors Sunka Simon and Carina Yervasi at Swarthmore and Mikelle Antoine at Ashesi. It is funded by the SUNY Center for Online International Collaborative Learning (COIL) and the Tri-Co Digital Humanities Initiative. “We were told at the COIL Institute that the idea of 30 minutes of synchronous discussion per class was too ambitious, but that time is what makes us not two separate classes, but one,” said Yervasi, an associate professor of French. Yervasi and Simon believe that the video of the former slave compound represents the power of the cross-cultural learning that is taking place. The course also has had a meaningful impact on those taking it. The course has had its share of technological problems, but the participants say the institutions’ common background has made the process well worth it. Although the form of learning has changed, the course is still deeply engrained in the ideals of the College. For more on Re-envisioing Diaspora, visit bit.ly/diasporas.